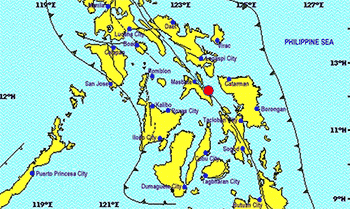 A moderate earthquake with a magnitude of 3.4 shook Masbate at 11:57 AM today, January 23. In the official report of Phivolcs, the epicenter is located at 12.16°N, 123.94°E - 002 km N 65° E of Palanas, Masbate. It had a depth of 22 kilometers.